In the run-up to Christmas 2018, Weir & Sons teamed up with the DSPCA for our Christmas campaign. 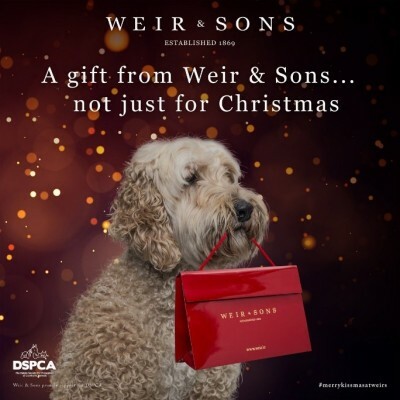 The campaign featured a Goldendoodle dog holding a Weir red bag with the tagline “A gift from Weir & Sons is not just for Christmas”. This campaign was also a promotion for the DSPCA and to remind people that a dog is not just for Christmas. We had used dogs in a campaign and on the cover of one of our magazines before and were eager to do more with man’s best friend. By pairing up with the DSPCA we felt we were also able to raise awareness on a relevant and important topic affecting many puppies every Christmas. The Dublin Society for the prevention of Cruelty to Animals (DSPCA) was established in 1840. It is the only animal charity in the city which cares for all animals, domestic and wild. The charity survives mainly on the funding of generous donations by the public which covers 95% of their costs. They are an impressive charity who help more than 25,000 animals per year. 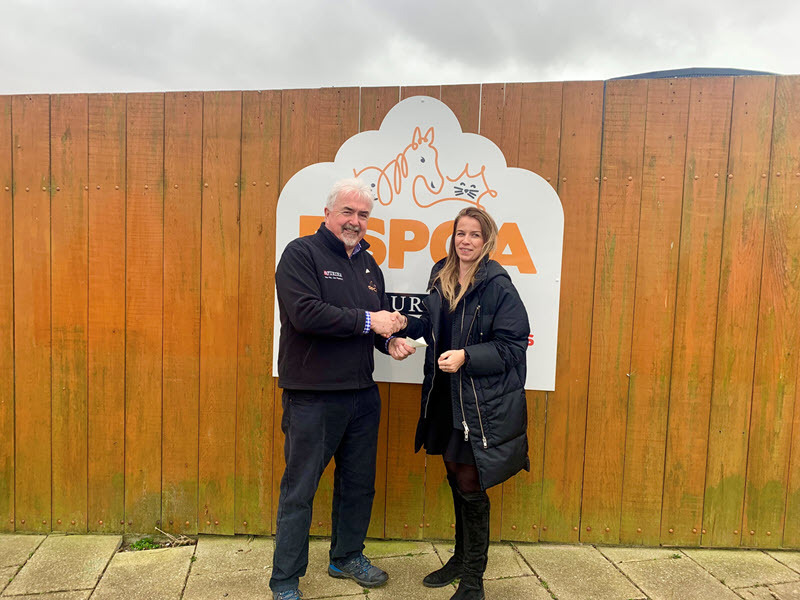 We visited the DSPCA on the 19th of February to give our donation for the campaign and to take a look around the premises. On arrival, we were greeted by Brian who manages the DSPCA, who was very welcoming and showed us all around the site. We started our tour of the premises with the cat sanctuary which at this time of year is not particularly full but led to some interesting facts that we had not known previously, such as: Cats can produce a new litter every six weeks when supplied with food and when the temperature is warm enough – this is why neutering your cat is incredibly important for controlling the stray/feral cat population in your area. All the cats in their kennels looked incredibly relaxed and comfortable while snoozing, however, this is not the case for a lot of cats that are left out in Dublin. The DSPCA re-homes around 1,000 cats a year. When moving onto the dog kennels we got to visit many dogs who were very friendly and happy to see us. The myth that dogs can develop behavioural issues from a pound can stop some people from adopting a perfectly lovable pooch. The DSPCA works hard to ensure that you are paired up with the right pet to suit both you and your new best friend. The adoption service they offer is second to none and ensures that you are not only paired with a suitable new friend but that you understand the responsibility required. Pets available for adoption from the DSPCA aren’t just Cats and Dogs, they also re-home small pets such as Rabbits, gerbils, guinea pigs and larger animals like horses and donkeys. 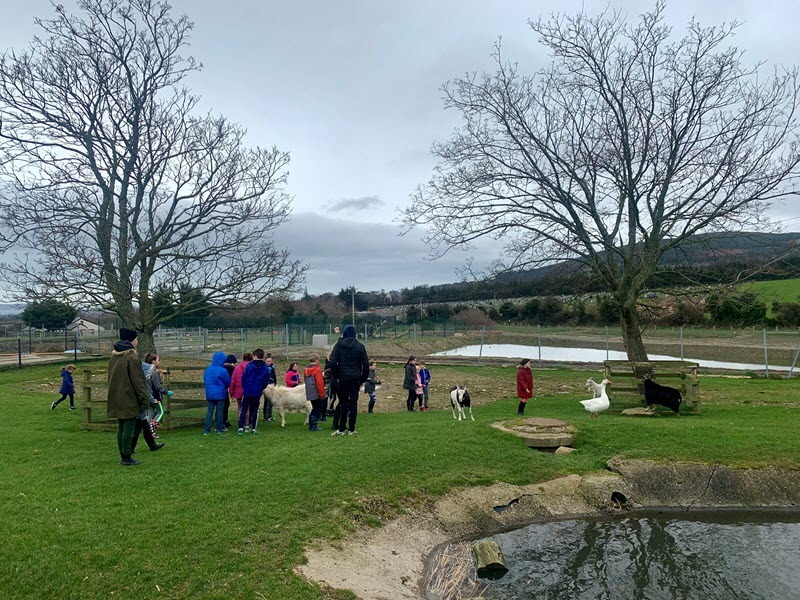 During our visit we got to meet so many happy characters in the care of the DSPCA, it was lovely to see how much they care for the animals and how happy each animal is, despite some having had a sadder start in life. Before leaving the DSPCA we left them with our donation, it was a lovely visit meeting the animals and staff at the DSPCA and we highly recommend visiting and adopting with the DSPCA if you are looking for a new family addition. Mobile Veterinary Clinic – they operate four animal mobile clinics that give subsidised veterinary care to pets whose owners are in receipt of welfare benefits. 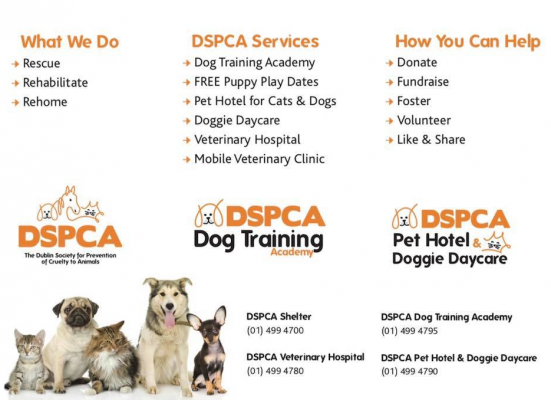 Humane Education – The DSPCA believes that educating people is the best prevention of animal cruelty, with this in mind they offer educational services for raising the public’s awareness. These services include school talks, shelter tours, work experience and much more. Rescue- Dedicated and trained inspectors work to investigate reports of animal cruelty and neglect. The DSPCA also rehabilitates, cares for and re-homes animals that it rescues when they ready to find them a forever home. They do not put healthy animals down. Pet Guardian – The DSPCA offer a service where you can request that they be the guardian of your pet when you may no longer be around to look after them yourself, this is a service that can give people peace of mind for the future of their pet without them.